Whether you are wanting to free up some extra space, or simply sell something that you no longer like, then here at Woodbridge Antiques Centre we can help, as we are currently buying in antique and vintage items. We buy all sorts of pieces from silver and jewellery to household items like jelly moulds and nutcrackers. You may have an idea of the pieces you already have, but sometimes the best things are tucked away, so it always pays to search in the back of those seldom visited cupboards, draws and desks for hidden gems. Gold including jewellery, small collectables & broken pieces. Silver jewellery, silver and silver plated items eg. Table items, vesta cases, desk items, novelties and cutlery. Vintage and antique ladies and men’s jewellery including costume jewellery, brooches, glass bead necklaces, rings, bracelets and cufflinks. Pre-1960s ladies accessories eg. hat pins, handbags, compacts, dressing table items. Sewing related items eg. thimbles, needlecases and pin cushions. Copper, brass & wooden items eg. Boxes, candlesticks, corkscrews & bookends. Decanters, cocktail shakers and glasses. Not everything that is old is necessarily worth a fortune but even everyday items like kitchen equipment or pens can find new homes. So don’t chuck it, get it checked out first! 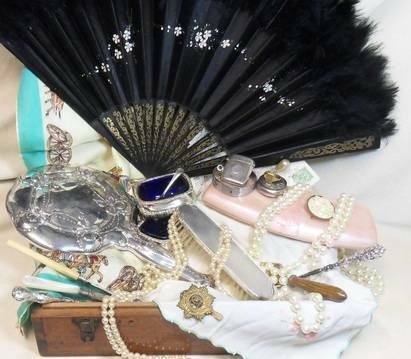 If you have any unwanted antique or vintage items, whether it is on its own or is part of collection, then give us a call on 01394 387210, please contact us before travelling though, just to make sure someone will be here to help you.